how: by Avis rental car or the Peugeot 206 master. We all jumped in the 206 Master early this morning because we wanted to get to Masada (מצודה) before the day got really hot. Well, considering it was 10 am and it was really hot and we were just leaving Jerusalem, I guess it was inevitable. We got to Masada around 11am and after a short introduction video about the fortress, we caught the cable car up to then decided to hike down. Masada is perched on top of an isolated mesa about 1300 feet or 400 meters high with a fantastic view of the Dead Sea below. 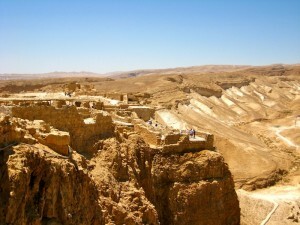 Originally, Masada was a fortress and refuge for Herod the Great. However, the Romans were determined to get in and after many failed attempts at breaching Masada’s walls, the Romans reached Masada only to find that the 960 Jews living inside had committed a mass suicide to escape imprisonment and slavery by the Romans. There were only 6 (this number varies from source to source) survivors who were children and left to tell the story that ‘Masada shall not fall again’. It was incredible. The views from the top, the fortress, the rooms, the history, and the scenery were spectacular. But it was hot. We headed back down to the car and started our search for a good beach to rest for the afternoon. We got to Ein Gedi where we went into the hotel area to eat a cheap and tasty buffet (this is basically the only place to buy food around the whole Dead Sea). Then we continued on until we got to Khalil Beach. We soon realized that all the beaches along the Dead Sea are private and we paid about 20 NIS each to get in. Whatever. Fantastic!! We jumped right in. Actually it’s quite impossible jump in. We first got stuck in the mud on the way to the water and then decided, who doesn’t need a free mud spa with Dead Sea salts. Back home we would pay loads for that kind of stuff and instead I had it right at my fingertips. Actually, I had it all over me. After we lathered up, we slowly dove into Dead Sea. Man. This water is WARM and super sah-weet. You just float. Just hang out… floating…even if you try… you just float. We had a great rest of the day there until we found ourselves slightly disturbed when we realized we were on an Israeli Only beach and the Palestinian beach was right next to us (separated by a fence). We only realized this when a Palestinian happened to cross the imaginary fence in the water and two big guys with massive guns walked over and started yelling. Oh jeeze. Seriously… nobody owns the Dead Sea… it was a sad wake-up call and we soon realized that somethings are impossible to escape. Look at more pictures on my picasa site.